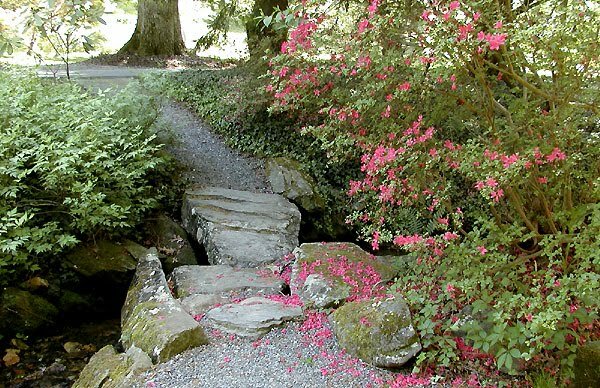 The Festival of Flowers at Biltmore Estate is wrapping up this weekend, but rest assured, there are plenty of flowers still at Biltmore and more things to see, including their newest spot for visitors to enjoy: Antler Hill Village. 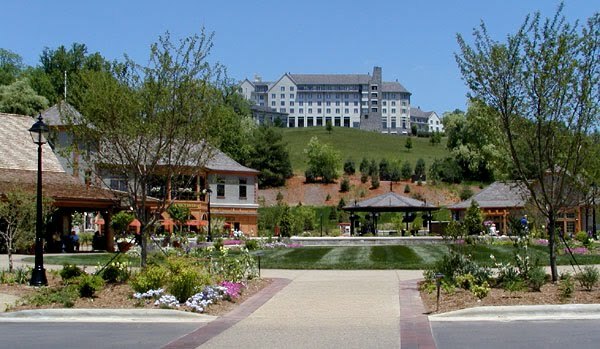 In fact, the grand opening of Antler Hill Village (pictured below, with the Inn on Biltmore in the background) is the weekend of May 20, and it’s also the 25th Anniversary celebration of the Winery that weekend. Innkeeper Brigette’s mom was in town earlier this month, and you know what that means…yes, that’s right, an afternoon trip to Biltmore, which is about 20 minutes from the Inn on Mill Creek. On the list of things to do during this trip was to check out what’s blooming in the gardens and to see how far along the roses were (ours were about a week behind in blooming, but they’re going strong now), to visit Antler Hill Village, and to do the Red Wine and Chocolate tasting at the Winery. First, we headed through the Azalea Garden and the Spring Garden. 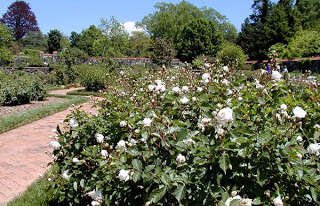 We then journeyed to the Walled Garden, where large numbers of rose bushes are planted. The roses at Biltmore are just spectacular; the scent as you walk through that section of the garden…divine. 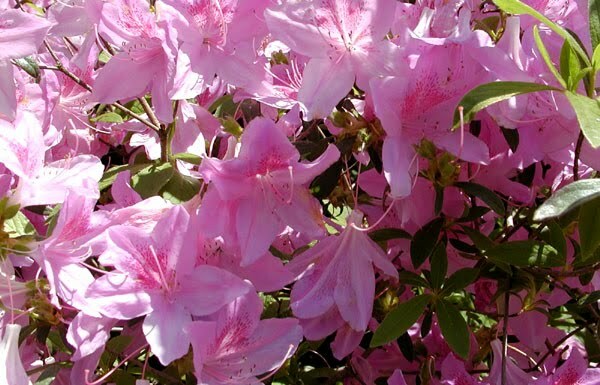 There were plenty of roses blooming at the beginning of May and we suspect it’s even grander now and will be all through the summer. The roses are having a really good year so far in our area. Later in the afternoon, we drove over to Antler Hill Village, located across from the Winery. What a neat place. It is brand new and they are in “soft opening” mode until the grand opening on May 20, but there were lots of people out and about enjoying themselves (mostly hanging out at the Creamery since it was 82 degrees that day!). 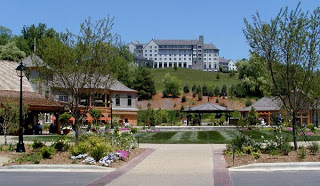 Antler Hill Village has shops, a historical exhibit hall telling neat details about the Vanderbilts and life at Biltmore, the Creamery (good spot for ice cream on a hot day), the Outdoor Adventure Center, which is the place to sign up for outdoor activities such as Segway tours, Land Rover School, fly fishing, float trips, carriage rides, horseback trail rides, bicycle rentals and more, plus an English tavern named after one of Mr. Vanderbilt’s dogs, Cedric. 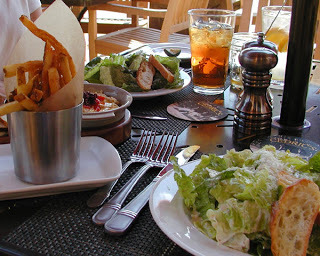 That’s where we had lunch — yummy salads, fries with chipotle ketchup, and hummus. They also have pub fare, like fish and chips, on their menu. Before lunch, we treated ourselves to the Red Wine and Chocolate tasting at the Winery. The new entrance to the Winery is through one of the old dairy tunnels leading from Antler Hill Village (the Winery was the former Biltmore Dairy). We were treated to chocolate truffles paired with four of Biltmore’s red wines. If you like chocolate and red wine, you can’t go wrong with this tasting. And you’ll learn a lot. From the gentleman who led the tasting, we learned that Biltmore uses two different kinds of barrels for aging its wine and that its Cardinal’s Crest wine is a blend of four different grapes, among other things. Oh, and we also learned that chocolate and red wine go really, really well together. 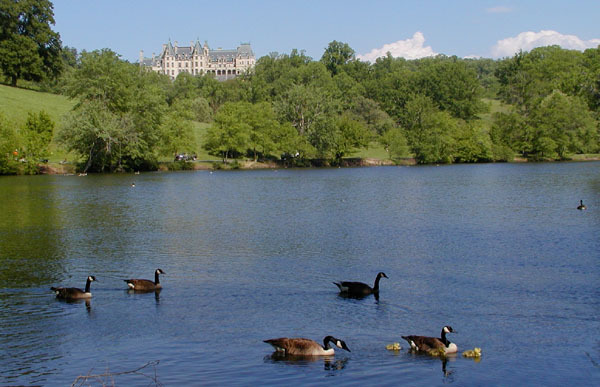 If you’re interested in an afternoon at Biltmore Estate when you stay at the Inn on Mill Creek, keep in mind you can pick up tickets here at the Inn for $10 off the regular gated daytime admission price, and the tickets are good for a free second day at Biltmore. Coming to Biltmore later this Spring and Summer: The Biltmore Summer Concert Series starts June 4, and the Flower Carpet will be in bloom starting August 20. This entry was posted in Uncategorized and tagged Biltmore, Spring by Inn on Mill Creek. Bookmark the permalink.